← Glinda: The Colourful and Sparkly! L’Oreal samples, An Insight Into My Life + 20!!! Evening, Fat Fashion Fans! I hope you’ve had a lovely weekend! My much-anticipated IKEA trip was cancelled because my mum is sick, so I wandered into the local town with my brother to finish shopping for her birthday next weekend and pick up a few bits for myself. You can expect a post with details coming verrrrry shortly! First things first: L’Oreal are giving away free samples of their brand new CC cream right now on their website! I’ve requested a sample of their Green variety (neutralises redness), but it also comes in Apricot to revive tired skin, and Mauve to transform dullness (descriptions whacked straight off of their website). You can find the deal here. Let me know if you make the most of this offer; I’ll make sure to keep my eyes out for any other offers for you! The CC creams cost £9.99 so it’s a good idea to try before you buy as they aren’t cheap; it’ll be interesting to see if they actually work. As mentioned yesterday, I’ve finally sorted out my bedroom! My dog Boudicca is now over 1 year old, and barely ever uses her crate, so I moved it out of my room and placed a blanket in her ‘spot’; it opened up so much space, my room now looks massive. I’ve still got to get a few bits and bobs but it’s almost sorted. 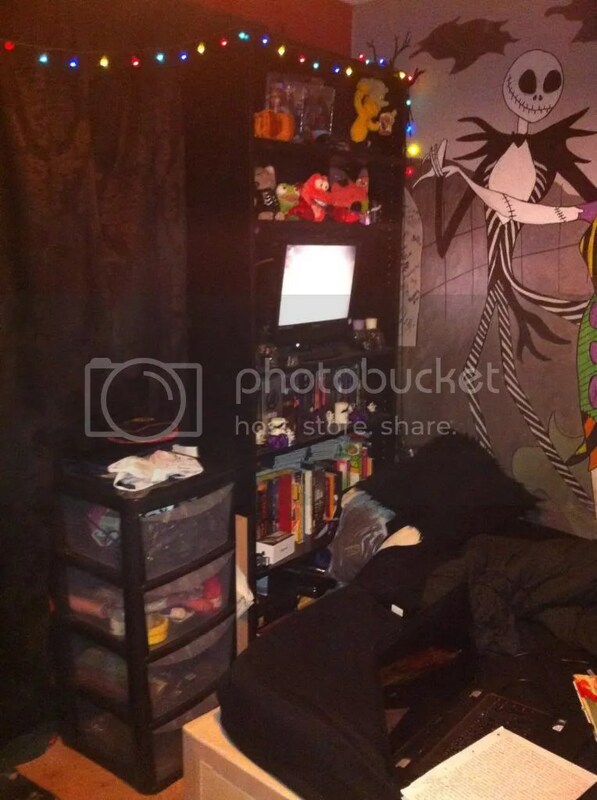 I thought it might be interesting for y’all to see some of my storage, plus I’m quite proud of how nifty my room looks these days. I’ve kinda commandeered the sink, haha! These are my everyday skincare products, minus my night cream, and my dental stuff (obv!). First thing I have to say- the really cheap pump soap from Lidl is amazing. It comes in three varieties, and I usually use the Milk and Honey one, but I felt like a change. This is Orchid and Lotus Flower, I believe, and it smells loooovely and is not drying on my hands at all. That’s a problem I can sometimes have with soap, because our water is so hard in the Chiltern Hills! You can also probably tell that I am a bit of a Soap & Glory whore- I love their products, and they really work for my skin. I’m pretty lucky with my skin anyway, and I never really have had any major breakouts, but their products make it that much more soft and clean feeling. They also smell lovely! Another beauty tip- because we need to look after our teeth too!- is that you don’t actually have to use big name, big brand toothpastes. My dentist recommends the supermarket own brand varieties! 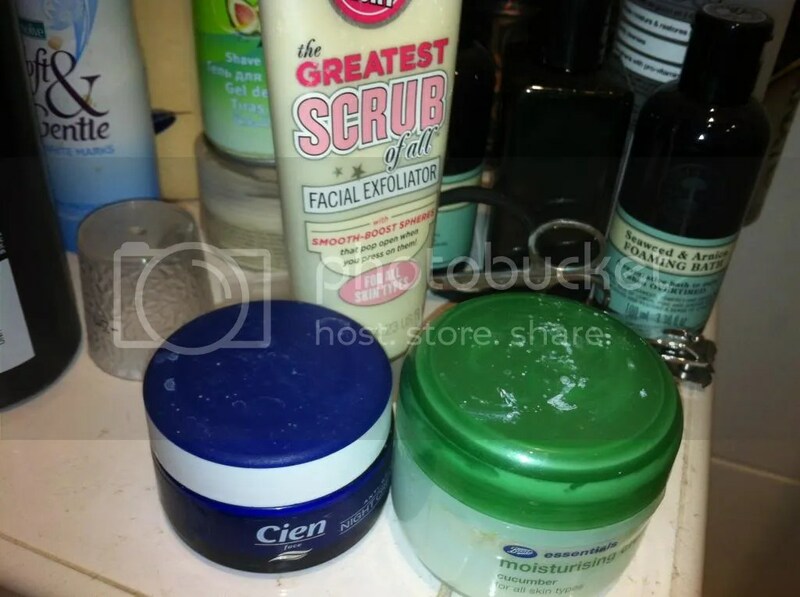 These are my night creams, and my twice a week facial ex-foliating product. I must say- the Cien Night Cream isn’t great. It was cheap from Lidl, but it’s very greasy. The Boots one is lovely, cooling and soothing, and the Greatest Scrub of All isn’t too harsh on my face at all, but perfect for getting rid of the dry skin I can sometimes get, especially after a shower. First things first; this is on my wall right next to my door. 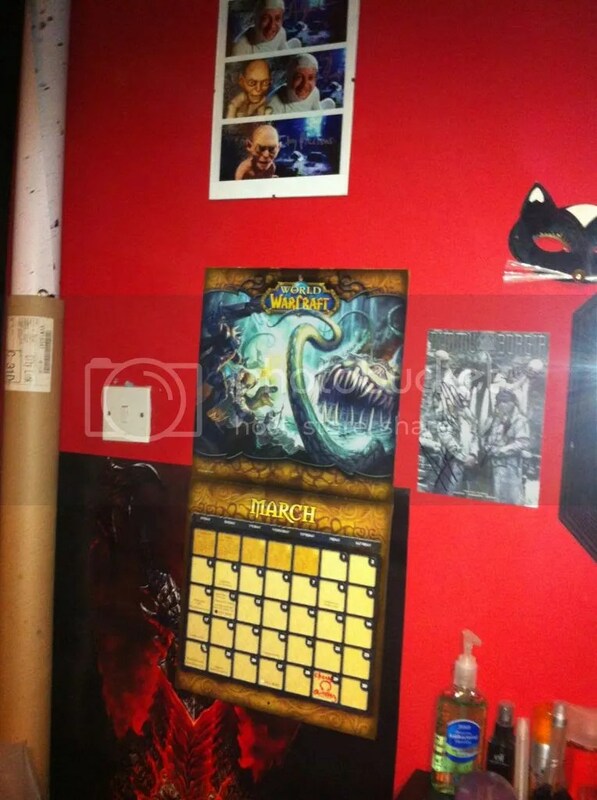 Yeah, that’s a World of Warcraft poster, and a World of Warcraft Villains of Azeroth calendar. I am that cool. Also the little orange scribble you can see on my calendar is the day I can get my septum jewellery changed! Yaaay! You can also see two of my coolest signed objects; a signed trio of photos by Andy Serkis (Gollum from LOTR) and a signed Dimmu Borgir postcard from when I met them at Bloodstock last year; they are one of my favourite bands and even though the vocalist Shagrath wasn’t there it was still one of the coolest things ever. Rolled up inside that cardboard tube is the biggest poster I have ever seen! It’s a Captain America movie poster my brother rescued from somewhere for me and I have no idea where to put it, but do I want a massive poster of Chris Evans as Captain America somewhere to look at? Hell yes I do! This is the back of my door, on which hangs my AMAZING fluffy leopard print dressing gown (Christmas present from my parents, am I a little sad it’s not a Sith robe? Yes. Do I still think it’s amazing and fluffy and SO comfortable? Yes!) You can also see my mini shrine to Antonio Banderas (dear LORD. Just… dear LORD) and my jewellery holder, as well as my every day body lotion product things. This is the top of my big chest of drawers. The two chests of drawers and both bookshelves are all from IKEA, just so you all know. I can’t remember the collection or product names, but they weren’t incredibly expensive and came in a range of colours and finishes. The jewellery tree you see on the right wasn’t really my style, but it’s handy and can hold so many things, including my hair flowers. In front of that are my four (though one is hidden!) 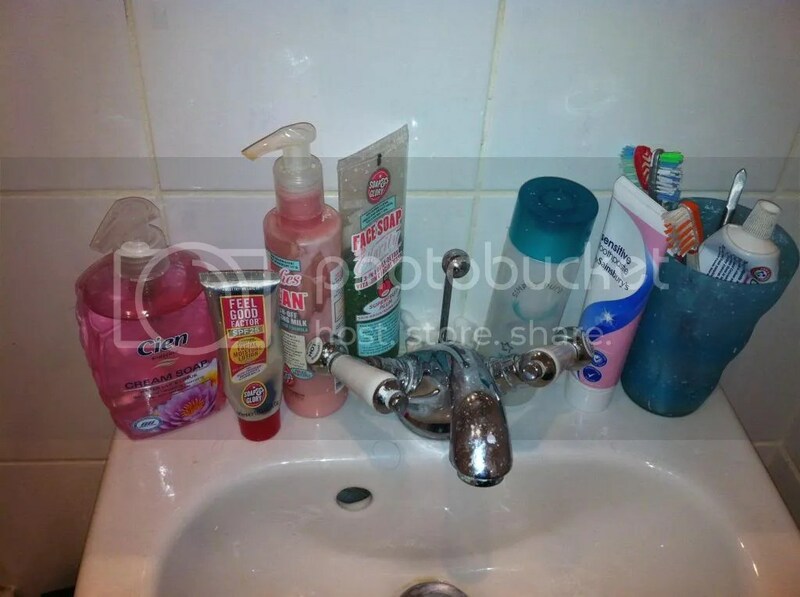 everyday lotion/moisturisers: A big pump dispenser of Soap & Glory The Righteous Butter and a tube of Heel Genius (just visible behind TRB), a pack of ELF’s Studio Lotion wipes in Shea Butter, and hidden from sight is Superdrug’s hand lotion. I desperately need both Heel Genius and the hand lotion because my feet get SO dry and cracked, and my hands tend to get dry as well. Then there’s Maleficent- I LOVE Maleficent, even though Sleeping Beauty isn’t my favourite Disney film, she’s one of my favourite villains… plus she has STYLE- and my Zen Micro. Please ignore the glass of Jack and Diet Coke (haha!) and the little melamine bowl… I decorate that wall with pretty flyers I pick up, mainly from Camden. You can also kinda see my pin board, where I pin all of the gig and theatre tickets from shows I go to. Some of them are signed, which is always good! Bookshelf the first! Please excuse my super messy bed! The wall by my bed is actually painted with a Nightmare Before Christmas mural I toiled away on when I was 14; I really like it, even though I might have to say goodbye to it as the walls in this house need to be treated. That will be a hard, hard pill to swallow! Here you can see the nifty television shelf I mentioned in my last post- isn’t my dad a brainy one? There are also my Disney toys and other bits and pieces on this shelf. I don’t think you can make it out, but in the middle of the top shelf is my (still boxed) Jareth doll from Labyrinth. I’m a geek, have you noticed? That tower unit was from Homebase and is perfect- I have my hair stuff, spare/occasional use skincare, incense and three pairs of more delicate shoes in it. It’s super light as well! A close up of my DVDs- you can also see my The Sims collection and my World of Warcraft boxes, haha! This isn’t even all of my DVDs/boxsets- I am in dire need of another shelf unit. A quick plug- if you or someone you know are a fan of quirky SciFi shows, please, please track down Farscape if you’ve never seen it before. It’s sensational. 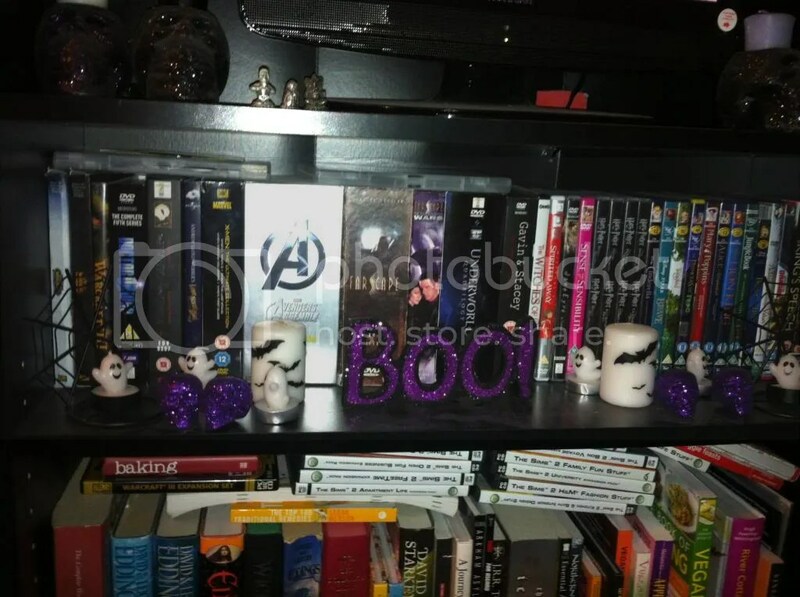 The candles are from Lidl around Halloween, the spiderweb holders are from Sainsbury’s (again around Halloween) and the purple skulls and ‘Boo!’ sign are from Clintons- I got them for about 50p each just before Christmas as they were selling off their- you guess it- Halloween products. 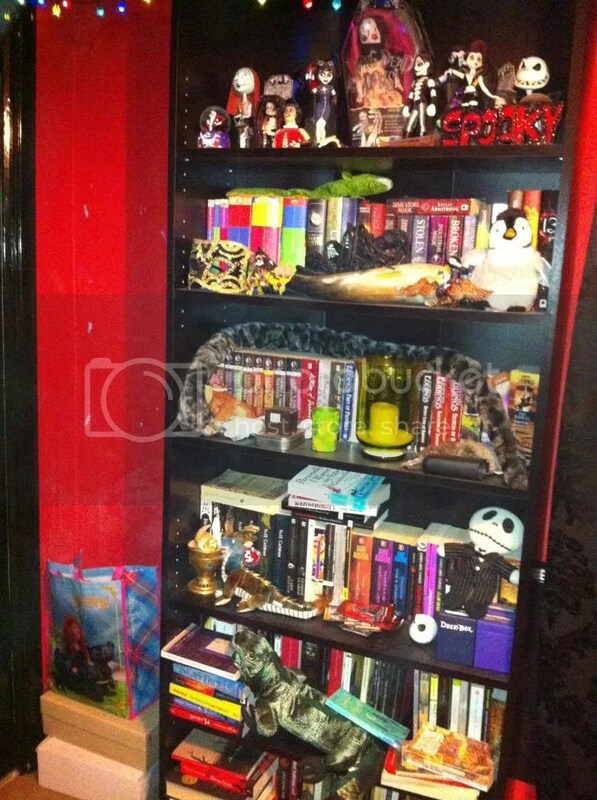 You can just see my beautiful glittery skull candle holders I got from Sainsbury’s (yes, around Halloween!) and they have single Yankee Candles in. I love how Yankee Candles smell, they’re just so expensive, so I haven’t lit these yet! 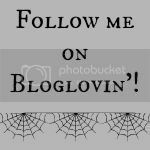 I love Halloween for quirky pieces to decorate my room with. This is my ‘book’ bookshelf. I have far too many, but I love to read! On here you can also see my drinking horn, my Magic the Gathering deck boxes (did I mention the geek thing?) and my ‘Goth’ ornaments. The ‘Spooky’ sign I got from Clintons with the purple skulls and ‘Boo!’ sign; I love how it looks. Finally, here is my dressing table/small chest of drawers, with my perfumes, hair stuff and make up brushes (and a lovely photo of me in my PJs…). The make up brushes are currently in a Nightmare Before Christmas mug, but it’s a little too tall and thin so I’m hoping to get a couple of nice pots from IKEA or Poundland. The mirrored box contains hair grips, miscellaneous jewellery such as my bone plugs and the pins from my heated rollers- it was a Christmas present from one of my piano students and it’s perfect. My make up is all in the top drawer of this unit in a ‘drawer organiser’ from IKEA, but I am not showing you that as it needs sorting some more! You can also see my collection of perfumes and my ELF Colour Correcting Yellow HD powder- it’s just too big to go into the drawer! There are also some boot laces to remind me to change the laces in my Docs! What’s your room storage like? Do you have lots of space, or is it cramped and full of shelves and space saving tools? I’d love to know! 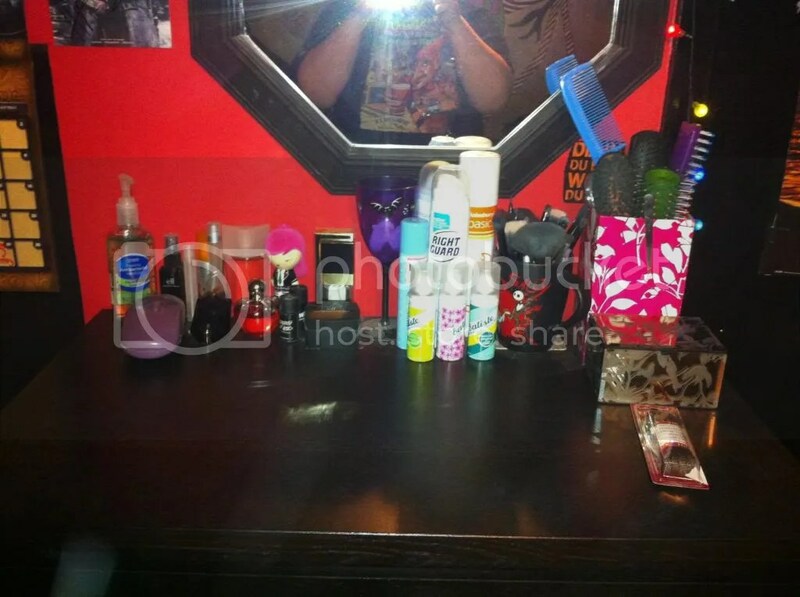 This entry was posted in Beauty, Hair, Makeup, Fashionista Musings and tagged CC Cream, L'Oreal freebie, Room tour. Bookmark the permalink.